Art doesn’t have to be limited to canvases mounted to the walls—the shelves you use to display your books and keepsakes can be works of art too. Eco-friendly furniture brand Formabilio demonstrates that belief with their sophisticated, nature-inspired Volatevia shelves, which are designed to look like leaves blowing in a gust of wind. Designed by Livia Chisari, the Volatevia shelves are made of bent metal sheets coated with water-based varnishes. The shelves come in a variety of shapes and sizes, and are available in the colors white, yellow, or green. Art doesn't have to be limited to canvases mounted to the walls—the shelves you use to display your books and keepsakes can be works of art too. Eco-friendly furniture brand Formabilio demonstrates that belief with their sophisticated, nature-inspired Volatevia shelves, which are designed to look like leaves blowing in a gust of wind. 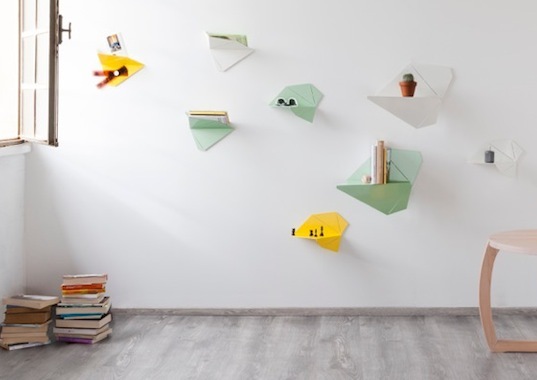 Designed by Livia Chisari, the Volatevia shelves are made of bent metal sheets coated with water-based varnishes. The shelves come in a variety of shapes and sizes, and are available in the colors white, yellow, or green.